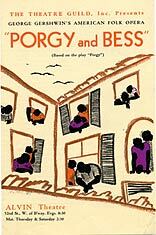 "Summertime" "A Woman Is a Sometime Thing" "My Man's Gone Now" "I Got Plenty O' Nuttin'" "Bess, You Is My Woman" "It Ain't Necessarily So" "I Loves You, Porgy"
“Porgy and Bess” opened to mixed reviews and a disappointingly short run — huge for an opera, but meager for a Broadway musical. Chagrined by its reception, both brothers returned to Hollywood. Within the span of two years, George would be dead, stricken by a brain tumor in July 1937.